St. Patrick's day cupcakes are the perfect treat to send to a school party. 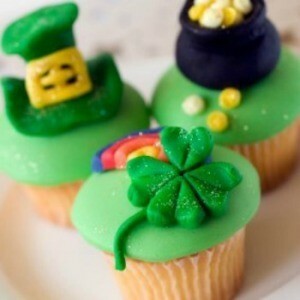 This is page contains St. Patrick's day cupcake ideas. Cupcakes are very popular right now and this is so easy and is great to make for St. Patrick's Day. Pour 12 oz. soda into a large bowl. Add the entire box of cake mix and in as few strokes as possible, stir ingredients together. Line a muffin tin with cupcake wrappers. Lightly spray the inside of each wrapper with a non-stick cooking spray. Spoon batter into cupcake wrappers, filling them about 3/4 full. Bake according to box directions. While cupcakes are cooking, mix skim milk, a few drops of green food coloring and pudding mix together. Let chill in refrigerator for at least 15 minutes. Once pudding has thickened, fold in Cool Whip until well mixed. Frost cupcakes (once cooled) with pudding and Cool Whip mixture. Source: I heard this on the television. This video has an easy to follow recipe for some delicious cupcakes that are sure to be a hit at your St. Patricks Day party.